It does not have heatsinks on the VRM, etc. Should I bother with a OC on a 2600K? Should I install thermal tape and attach small heatsinks I get on Ebay and install a TOP down cooler to help VRMs? Whats a good top down cooler? Cheap alright one. Fun project. I don't really OC but I would like to OC to about 4.2GHz and hope it lasts a while. This is what I am getting to help cool the mobo. I will add a fan to cool the area. I don't want to wait that long for them to arrive from China, especially during Lunar New Year. Does anyone have this size of heatsink along with thermal tape they could sell me? Last edited by justmehereajax; February 4, 2019 at 02:01 AM. In my experience with similar boards, as long as you give the VRM area good airflow you should be fine, especially if you only want to push into low 4's range. IMO low 4s without high voltage (like an auto OC), and you should be fine. If you start running high OC or high voltages then you may be asking for issues. They have to be a special size = 6.5x6x3.5mm. I also measured them myself. I have 15 mosfets and this package gives me 20. I have a top down cooler I bought a while back that I am gonna use (CM Gemini M4) that I think will help with the cooling too. Got the heatsinks and installed them but it will be used as a backup mobo. My buddy sold me a Asus PBZ68 Pro board with massive VRM heatsinks. My 212 evo had to be mounted bottom to top to fit lol because of the heatsinks. But I still get throttling when I benchmark it. 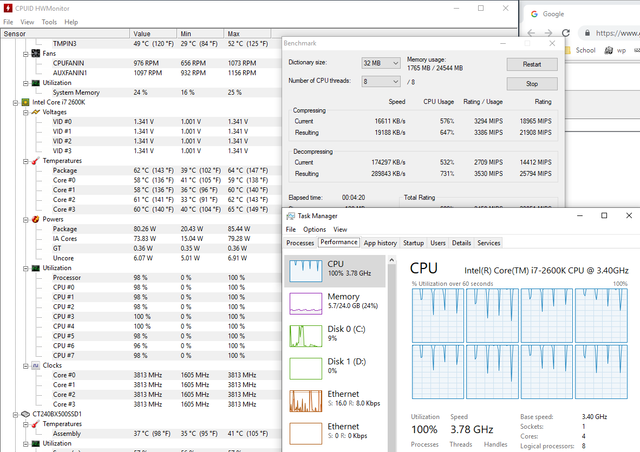 Ever 30 seconds the CPU usage drops to 80s% and goes back up to 100%. I use 7zip. What temps and voltage do you have under load?